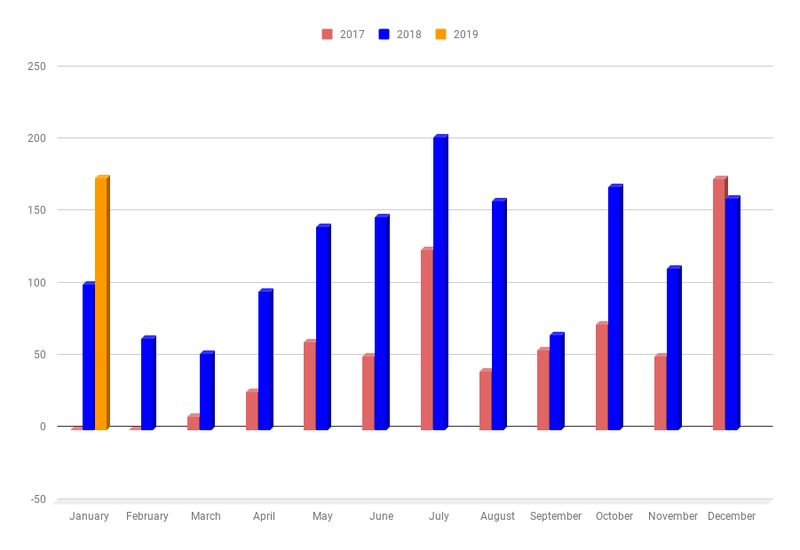 Welcome to the twenty-first (#21) dividend income report, covering earnings I've made from dividend-paying stocks, peer to peer lending (both fiat and cryptocurrencies) in January 2019. Wow, times flies, the last January disappeared like a flicker, little miss Fischer baby girl turned already 6-month old. This January also marked a small 2 years anniversary since In originally set my goal to have in savings account 1 million dollars by 2045. In general, January was great for most of the investors (except probably just crypto investments) as in January most markets recovered after the sluggish year end of 2018. In total there were 11 great companies paying us dividends in January. I keep investing in peer to peer lending (Mintos.com), see Mintos.com Review After 24 Month of Investing in Peer to Peer Lending, European and Baltic stocks, US stocks and crypto. The YoY growth rate for my dividend income in January 2019 was + 73.07%. or $73.76 more than a year ago in January 2018. That's the Growth rate I like and would love to see at least +75$ in the future. January 2019 marks already the second anniversary since I started this road to the million dollars in savings account journey. The result, so far, looks quite good. The cumulative earnings for 2019 now are $174.71 which is exactly 8.54% from my goal of 2019 ($2045). On the average, it would ask me to generate $170.03 every month for the next 11 months to reach my goal. Right, now I'm very confident reaching this goal. This is my favorite part of the reports - trying to forecast/set goals for the next year. I have a $220 goal for the January 2020. From today's perspective looks very possible, sure, will ask to add a few more monthly/quarterly dividend paying stocks.